Saturday 12 November was the turn of this years 6th group of grade 9 scholars from Somerset College to hike the Landroskloof section of the annual Somerset Trek. Each year, members of the HH section of the Mountain Club of South Africa accompany the learners on this section of their adventure. On Saturday, Johann Wiid ZS1JHW, was one of the two rescue team members accompanying the group. The group departed the MCSA Johnson Hut at around 7am in cool conditions. About two and a half hours into the hike, one of the learners sustained a knee injury that prevented her from continuing or turning back. The standard rescue plan was immediately activated by the two rescuers with the group. Luckily the group was still about 300m below the cloud level and so, after consultation with the EMS rescue manager on duty, the AMS Skymed rescue helicopter was recalled from and air-sea rescue exercise in Melkbosstrand and dispatched to the scene. Paul ZS1V responded to the WSAR callout sent by Johann ZS1JM, and secured a landing zone for the helicopter near the gates of the Vergelegen farm. A technical rescuer and a paramedic were hoisted down to the patient. After consultation between Paul and Skymed, the LZ was moved to the Helderberg Nature Reserve. This is further away from the scene, but more familiar to the helicopter crew. Since the weather was worsening, the remainder of the group of 20 hikers turned around and proceeded back down to the Johnson Hut. Unfortunately, a second hiker suffered an ankle injury on the way back down. After the first patient was extracted, the technical rescuer and paramedic were relocated lower down the kloof to prepare the second casualty for extraction. 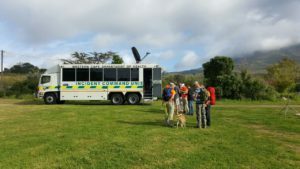 The second patient, paramedic and technical rescuer were all subsequently extracted to the Helderberg Nature Reserve and a waiting ambulance transported the casualties to hospital. Standdown at 13.00. At 18h02 a callout to Newlands Ravine to assist a party of 3 stuck on a ledge was issued. I (Phil – ZS1VCC) was activated at 18h14 for logistics/comms support. Upon my arrival in Newlands forest at ±19h00, I located Metro1 but all 3 Metro rescue technicians had deployed into the mountain as a hasty team. With permission from the Metro rescuers (obtained via the radio), I proceeded to open and setup Metro 1 and established comms with the team. I was joined by the MCSA field manager a little while later, and soon thereafter by additional MCSA and HN members. The hasty team located the party at 19:43, and by 19h50 had completed their assessment, indicating no injuries and that no additional assistance was required. They proceeded to walk the patients down (which was actually a party of 4, 3 males + 1 female aged 18-19 yrs). The party was met by myself at the entrance to the contour path hiking trail, and transported down to Metro1 with the additional assistance of the Metro bakkie. All teams were logged back in at 21h42 and debriefed. Patients were collected by parent(s). The rescue was attended by HAMNET, MCSA, HN and SANParks personnel, and additional support was provided by NCC duty members at the forestry station. 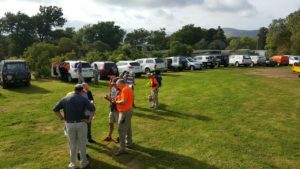 On the 15 Oct 2016 members of the various WSAR affiliated groups attended a communication and navigation training exercise in the Helderberg region (Somerset West). This exercise was arranged and managed by Delta Search & Rescue in association with EMS (Winelands). The exercise was controlled from the Metro 4 incident command vehicle (bus), and manned by Delta Search & Rescue, EMS personnel as well as by Matt (ZS1MTF) & Phil (ZS1VCC). Ground teams comprised 4×4 operators and on-foot rescuers (incl. K9s). Basic instructions and maps were provided to the ground teams at a briefing, but each team was purposefully not given a full set of instructions for their tasks. 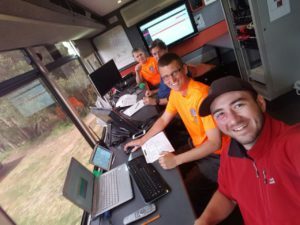 This necessitated each team to check in with Control and to be given precise instructions and coordinates for selected tasks over the radio network. This was to simulate a real search & rescue with multiple field teams over a wide area, and to assess the effectiveness of communications and the passing of critical messages in this environment. 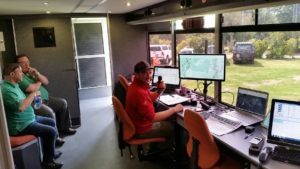 During the later stages of the training exercise, Metro 4 received a real rescue callout (in the Helderberg region) from Metro Control. An elderly patient, whom was hiking with a group, was unresponsive and assistance was requested. All teams on training were asked to standby while the incident commander and his team assessed the situation and set in motion the rescue procedure. Some of the nearby training teams were asked to respond whist an ILS medic and Skymed was dispatched. The patient was assessed by the ILS medic and his status was unfortunately “blue” (suspected heart attack). Skymed 1 was used to extract the patient and transported him to an landing zone near Metro 4 (in the Helderberg Nature Reserve). The various necessary services were dispatched to receive the patient upon Skymed’s arrival. 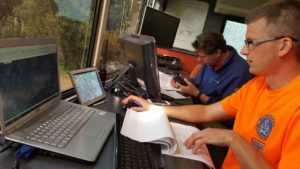 A few members of the WSAR training exercise, which had assisted in the rescue, were tasked with accompanying the remainder of the hiking group off the mountain and down to Metro 4. The training exercise was concluded shortly after the rescue, and it was considered a successful event. Many salient points were raised and much was learned from the exercise. The exercise was saddened by the unfortunate outcome of the rescue; especially as it happened in such close proximity to the training event, and that there was little our teams could do to change the outcome. On Monday afternoon 2016-07-18, Matt ZS1MJJ observed a riderless motorcycle flying through the air in the vicinity of the N2 between Somerset West and Gordon’s Bay. He stopped to investigate and found the rider lying 10 meters away from the motorcycle. The rider was in the water, unconscious, and would have drowned. Matt tuned to the local 145.600 repeater and called for assistance. 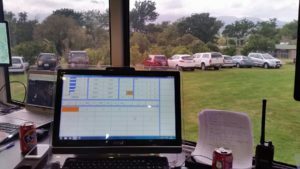 Paul ZS1V was mobile elsewhere in the Helderberg and responded to his call. Matt informed Paul of the location and situation. Using the local Neighbourhood Watch commercial repeater, Paul called the Somerset West Neighbourhood Watch Control room, which has links to the local security companies, paramedic services and SAPS. The control room operator soon returned with a message indicating that an ER24 ambulance and a SAPS vehicle were en route. Well done to Matt for his quick thinking and willingness to stop and quite likely save a life, and to the Somerset West NHW for their assistance.